Pictured are a photograph and CT scan of Sts 5, the most well-preserved specimen of Australopithecus africanus. Credit: Images courtesy of the Ditsong National Museum of Natural History, formerly the Transvaal Museum. CT scans of fossil skull fragments may help researchers settle a long-standing debate about the evolution of Africa's Australopithecus, a key ancestor of modern humans that died out some 1.4 million years ago. 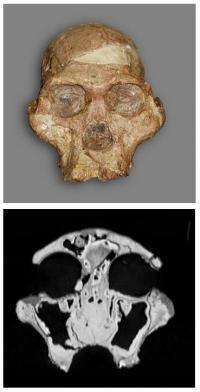 The study, to be published in the Proceedings of the National Academy of Sciences, explains how CT scans shed new light on a classic evolutionary puzzle by providing crucial information about the internal anatomy of the face. For decades scientists have disagreed about the significance of facial features shared by a number of Australopithecus species, and in particular two bony columns known as "anterior pillars" that extend up from the canine teeth and bracket the nasal opening. Dr Brian Villmoare (University College London and The George Washington University) and Professor William Kimbel (Arizona State University) analysed CT scans of fossil skull fragments from five Australopithecus species and found that beneath the skin the internal structure of the anterior pillars is quite different for different species. According to the authors, South Africa's A. robustus and East Africa's A. boisei had solid columns of dense, spongy bone tissue and were probably sister species, while A. africanus (also from South Africa) probably evolved in parallel as its pillars are simply hollow columns of bone. The authors argue that these structural differences show that anterior pillars evolved via different pathways in different species. The findings challenge long-standing theories that similar external facial features represent shared traits inherited from a common ancestor, and suggest instead that external similarities in South Africa's A. africanus and A. robustus were due to parallel evolution. "We believe that the detailed similarities in the internal anatomy of the face strongly supports the hypothesis that there was a single evolutionary branch of 'robust australopithecines', and that the A. africanus and A. boisei forms both shared a common ancestor," says Dr Villmoare. "The external similarity of the anterior pillar in other Australopith species may be related to convergence on a similar dietary niche, but does not seem to indicate shared ancestry."